V.D.M.Jabez Daniel and M.Kanishka. "A Computationally Efficient Halfband FIR Filter Bank for Hearing Aids." International Journal for Scientific Research and Development [Conference 11 : ICCT 19] (2019): 1-6. S.Dialine and K.P.Ajitha Gladis . "Aircraft Type Recognition in Remote Sensing Images Using Deep CNN." International Journal for Scientific Research and Development [Conference 11 : ICCT 19] (2019): 7-12. Dr.G.Glorindal Selvam, S.Pushpa, P.Selvi, R.Suganya and D.UshaSameshwari. "An Emerging Smart Solution for Panchayat Problems in All Villages." International Journal for Scientific Research and Development [Conference 11 : ICCT 19] (2019): 13-16. S.Jeyakumar, G.Jemilda, M.Chithirai Malar, S.Jeba and C.Jesintha. "Blood Donor Management System Using Android Application." International Journal for Scientific Research and Development [Conference 11 : ICCT 19] (2019): 17-26. M Malathy. "Bluetooth Based Object Tracking and Location Finder." International Journal for Scientific Research and Development [Conference 11 : ICCT 19] (2019): 27-29. Mrs.K.Emily Esther Rani, Dr.S.Baulkani, M.Divya Nanthini, P.Keerthana and R.Kavitha. "Extracting 2D Shape Features for Early Detection of Alzheimers disease." International Journal for Scientific Research and Development [Conference 11 : ICCT 19] (2019): 30-34. G. Jeya Sutha Perciya. "Emerging Trends In IoT with Data Mining." International Journal for Scientific Research and Development [Conference 11 : ICCT 19] (2019): 35-40. R. Felista Sugirtha Lizy. "Emerging Trends in Network Security Using Cryptography." International Journal for Scientific Research and Development [Conference 11 : ICCT 19] (2019): 41-45. Mr.A.E.K. Selvan Devadoss, Dr.P.Saravannan and Dr.K.Kannan. "Facilitating the Visually Impaired People for Using Library Management System in the Era of Digitalization." International Journal for Scientific Research and Development [Conference 11 : ICCT 19] (2019): 46-50. T. Jeyabarvin, J.Vincila Evangeline and G.Manobai Anesi. "Monitoring Environment with Wireless Sensor Network based on IoT." International Journal for Scientific Research and Development [Conference 11 : ICCT 19] (2019): 51-54. M. Anbukkarasi and M. Selvalakshmi. "Optimizing the Potential Attacks through Safety and Secrecy in Vehicular Ad Hoc Networks." International Journal for Scientific Research and Development [Conference 11 : ICCT 19] (2019): 55-60. Chithra Devi R, Ananda Devi R and Bharathy J. "Some Study on Public Key Cryptography Algorithms." International Journal for Scientific Research and Development [Conference 11 : ICCT 19] (2019): 61-66. G. Indra Navaroj and Dr. E. Golden Julie. "Survey on Privacy and Security Issues in IoT Applications using Blockchain." 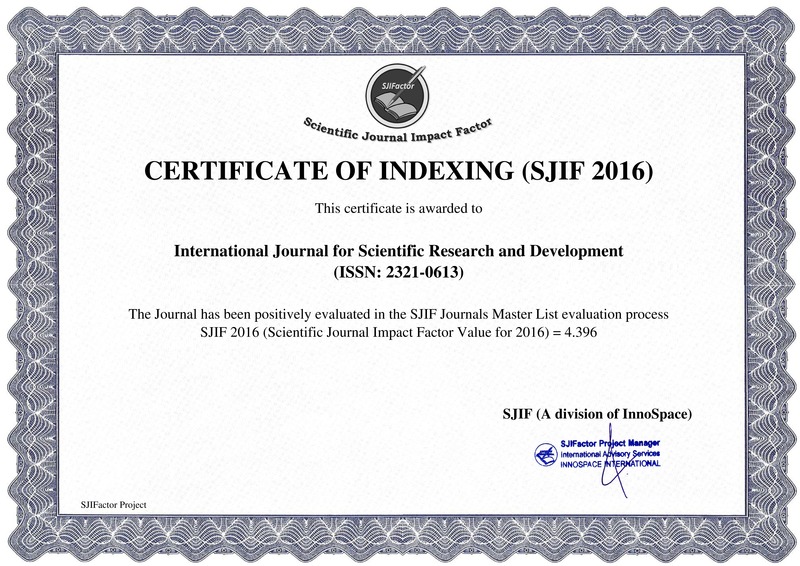 International Journal for Scientific Research and Development [Conference 11 : ICCT 19] (2019): 67-71.